The first church in Berg, the ancestral village of the Stoltz family in the Pfalz region of today’s Germany, was built in 1608. It was quite small, most likely a chapel. It had room for only about 65 people. Over the years the village continued to grow. 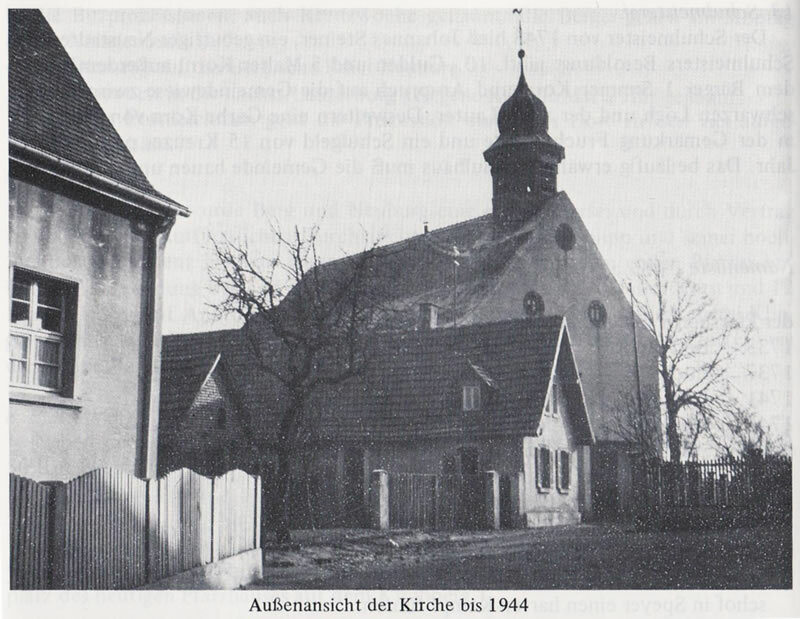 In 1733 Berg became a parish, with its own pastor. The parish church became increasingly too small. In 1779 a commission was created to evaluate the need for a new church in Berg. The commission included a representative of Damian August Phillipp Karl, prince bishop of Speyer, an architect from Lauterbourg, the pastor Franz Joseph Kahe, the mayor and citizens of the area. The presence of 232 persons demonstrated that the church was too small. At this time the parishioners of Berg numbered 96 men, 89 women, 49 older and 71 younger girls, as well as 27 older and 47 younger boys. And in fact the church building was not only too small, it was also in such poor repair that in 1780 Bishop August forbad the use of the church and had the pastor celebrate Mass in the parish barn. Six years later, the bishop had done nothing about the church and the people of Berg were still worshiping in the pastor’s barn. The pastor wrote a strongly-worded letter to the bishop, urging him to press the matter with the Count of Zweibrücken. Not content to wait for the bishop, in March of that year the mayor of Berg wrote to the count complaining of the situation. The letter was co-signed by the mayor, Andreas Lindmann, and Jakob Scherrer, who was the son of my 6th grand-aunt Magdalena Stoltz (abt. 1711-29 Aug 1761) and Theodor Scherrer (1710-?). Magdalena’s parents were my seventh great-grandparents Johann Adam Stoltz (abt. 1679-4 Sep 1729) and Maria Eva Kas (abt. 1676-3 Feb 1753), my earliest known ancestors in Berg. The letter was answered on 15 December 1786 with a letter from the bishop outlining an agreement between him and the count to build a new church in Berg. Mayor Scherrer of Berg continued to put pressure on the count to make good on his word through his office in Hagenbach. The first evidence of anything being done about the church was a notation in the town records of a payment from mayor Martin Scherrer of 52 guilder to a Joseph Weißenburger on 28 August 1788. According to Ludwig Stehle, the note is signed by Georg Knell, Christoph Bommer and Diberius Dorn. I assume Stehle had a typo (as there was no family by the name of Knell in Berg) and he meant Georg Knöll, my fifth great-grandfather, Christopher Bummer, who is no doubt related in some way to my great-great-great-grandmother Magdalena Bummer, and Tiberius Dorn, whose great-granddaughter Katharina Kattus married my great-great-great-granduncle Peter Stoltz. Another ancestor mentioned in the records of the construction of the new church are my sixth-great-grandfather Jakob Fried (1723-?). From that time until the mid-1800s when my ancestors came to the United States, the Stoltz family and related families were members of St. Bartholomew Church in Berg. Another branch of the family, led by my fifth great-granduncle Karl Theodor Stolz (16 Nov 1763-abt. 1815) had emigrated from Berg to the Russian Empire (in today’s Ukraine) in 1809, shortly after the construction of the new church. On the night of 22 December 1944, the town of Berg was bombed by the Allies, most likely by American planes. The 1788 church received a direct hit and was destroyed; only the sacristy remained standing. 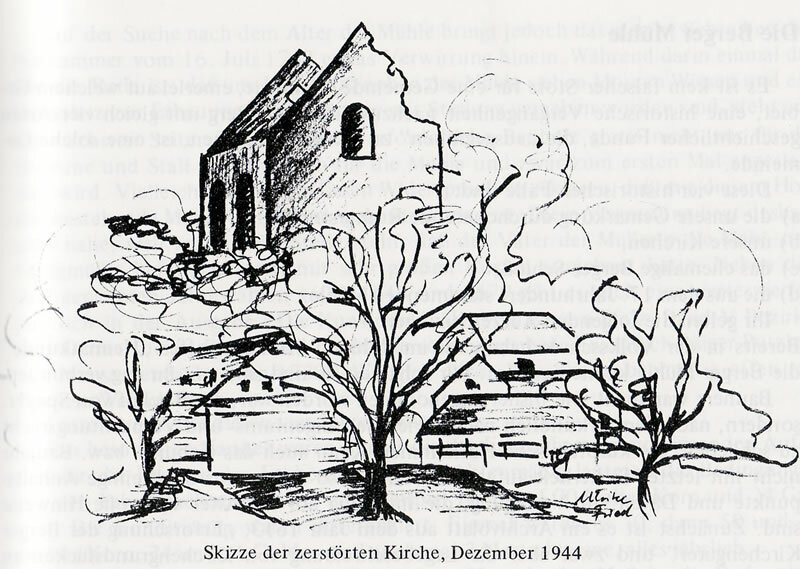 Despite the extreme hardship and poverty of the postwar years, the people of Berg rebuilt St. Bartholomew Church and the new church was dedicated on 10 November 1949. This post is based on research contained in the book Berger Ortschronik, the history of Berg by Ludwig Stehle. I was just in Berg Germany May 12th and was inside St. Bartholomew Church and spent the entire day walking around Berg. 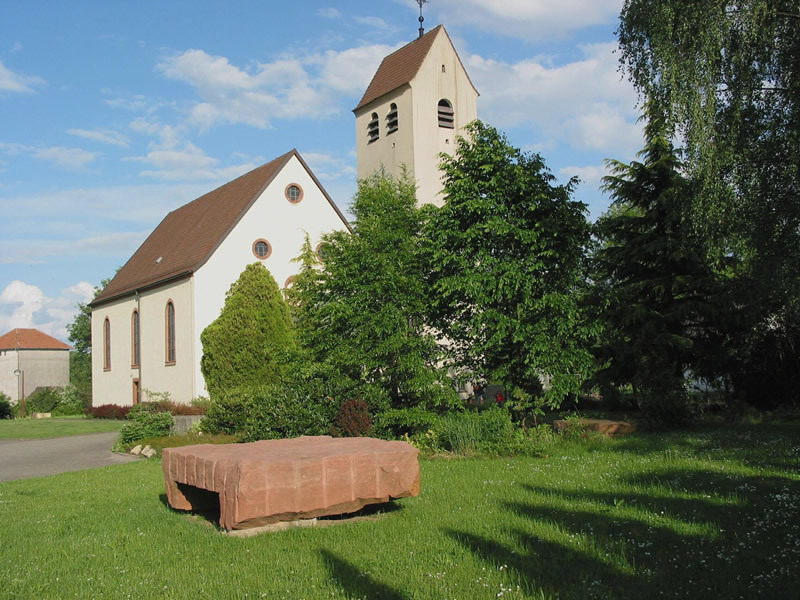 My ancestor, Andreas Beldy, was baptized in St. John and St. Bartholmew Church in Speyer, Pfalz in 1778). 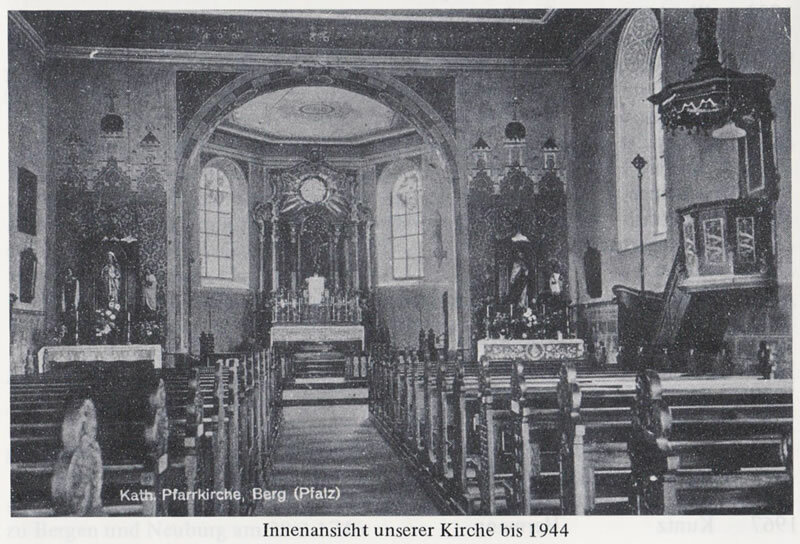 Would you know if this is now St. Bartholomew’s in Berg? The first named may be John Proud, born March 1726 resident of Burlington County, WEst Jersey (later New Jersey) in America. Levi S(tratton Proud, the ancestor of this John Proud, lived in Burlington County, Evesham Township, New Jresey and migrated later to the state of Delaware, later leaving a record that “the fist Proud in America” was from the Rhein/Rhine region of Germany with his wife from the Alsace Loriane. I hold a extensive record of their following generations, their migrations in America and aspects of their history.